HomeForumCycles in History and How They Affe…The Next Prophet? The cycles of history point to so many similarities in climate, health, societal change, and religion, among other characteristics of our experience on this planet. One of them that’s striking is the appearance of prophets at two of these cycle highs. A major cycle is the 172 year cycle that I’ve written about many times before. Dr. Raymond Wheeleridentified the 170 year cycle in his work and in a simplified cycle clock, The Drought Clock. Stephen Puetz mathematically adjusted the cycle to 172 years in his ground-breaking book, The Unified Cycle Theory. While this cycle peak marks an economic high and subsequent crash, it’s also parallels the Uranus-Neptune conjunction of 171.4 years. The turns are supported by events throughout history within mathematical probabilities that make their reality indisputable. In fact, for the last three conjunctions, we experienced a major market sell-off fourteen years after the conjunctive event. Major cycles are harmonic (X3) and both Puetz and Wheeler identified the 515 year cycle (171.4 X 3) as the civilization cycle. Two of the theoretical peaks were the years 118 AD and 633 AD. Each of these dates marked the appearance of prophets and the beginning, or resurgence of religions (Jesus and Muhammed). The chart below (click to enlarge) is from the work of Dr. Wheeler and shows the temperature peaks of both eras and the relative events. The inset denotes the height of the Roman Empire (the chart cover the years ~100 BC – 135 AD). I’ve written about this before in a post about the correlation of climate to the demise of the Empire. The SP (Stephen Puetz “theoretical cycle top”) for the Roman Empire was 118 AD (the 515 year civilization peak cycle), which began the demise of the Roman Empire over a period of several hundred years. Jesus Christ was alive from 4 BC through 30 AD, just as the temperature cooled. He appeared, as did Muhammed, just before the cycle peak. As I’ve written before, this forecast civil wars, a period of social revolution, and political turmoil. A similar pattern exerted itself at the cycle top of the 600 AD period (approximately 500 years later). After 395 AD, the Roman Empire split it two, the eastern half survived and historians refer to it as the Byzantine Empire. Under Justinian (527-565) the empire regained some strength. 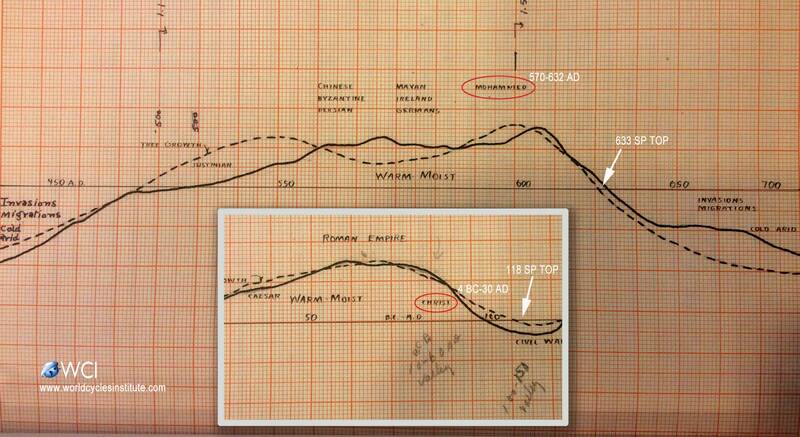 You can see on the larger chart that the temperature rose at that time (after decades of colder, dryer climate). Justinian grew the empire to include North Africa, Italy, Sicily, Sardinia and parts of Spain. However, after the Stephen Puetz theoretical peak (633 AD), climate turned colder and dryer and this marked the start of the gradual upheaval of the empire. Only a year later, Byzantium started to lose a large portion of its territory to the Arabs. The Byzantium Empire was later revived in the next 515 year cycle, which peaked in the year 1148. Similar to the top of the Roman Empire, which coincided with the theoretical peak and the coming of Christ, Muhammed (570-632 AD) appeared just before the theoretical top of this 515 year cycle. He is widely regarded as the founder of Islam by non-Muslims. He is known as the “Holy Prophet” to Muslims, almost all of whom consider him to be the last prophet sent by God to mankind to restore Islam. However, within ten years of his death in 632, which also marked the cycle peak, Ridda Wars, or the Wars of Apostasy ” broke out, and the Rashidun Caliphate was established. The peak led to a period of intrigue and assassinations of its leaders and civil wars. The 515 year cycle tops always herald in a demise of the current civilization, and a major social and religious upheaval. It also led to major migrations in both cases. Prophets also arose to prominence and led to a greater reliance of religion and religious teachings. We’re also reaching the peak of a civilization cycle. The 172 cycle (and top of the climate cycle) was in 2007 (which was 14 years after the Uranus/Neptune conjunction). The peak of the civilization cycle in is 2178 (another 172 years cycle from 2007). Are we expecting a prophet to appear on the horizon? The timing is right and we certainly need one, based on the state of the world. You’ll also find a large temperature drop in the year 1929, illustrated in my video, “Don’t Like the Climate? Wait a Cycle!” which shows how the DOW rises and fall with temperature. The short story is that we’ve passed the 172 peak in 2007. Central banks have managed to keep the stock market up through this year through their policies, which have been described as the biggest financial “experiment” in history, by none other than Lord Rothschild himself.